Shooting an object directly by the flash gun will make the light and shadow look too rigid. After a softbox is added in front of the flash gun, the light will be softened and the contrast will be lowered in the photo. 15 FOOT COILED SYNCH SYNC CORD FOR SUNPAK 120J 511 611 622. 15 foot PC to HH (Household) synch cord for professional lighting systems. One end is a male PC plug and the other end is the 'AC' style for use with Sunpak flash systems. Canon Speedlite 270EX. The diffuser is used to create exposures of even density over the entire surface of film. Use the diffuser by placing it flush against the front of the lens and exposing through it. Nikon Speedlite SB-800 SB800. To use the diffuser place it flush against the front of the Speedlites lens and flash through it, thus the light will pass through the diffuser creating an even density over the whole subject area. Canon Speedlight 600EX-RT Flash. Ultra-Wide Angle of Coverage. Diffuses Light from Shoe-Mount Flash. Best Quality. 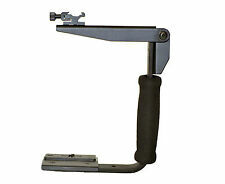 Lightweight, compact flash bracket with rotating flash arm. We are a Authorized Hahnel Dealer. Flash Softbox Bounce Diffuser Cap Box For Canon 600EX 600EX-RT Speedlite 600EX 600EX-RT Flash. For Canon Speedlite 600EX 600EX-RT Speedlite. Perfect compatible for your Speedlite. This flash diffuser is an essential piece of kit that any level of the photographer should own. Pop-Up Flash diffuser Universal Softbox For SLR & DSLR cameras: C, N, S, O, Etc. What a great idea—and so useful. which has a “pop-up” flash: Canon, Nikon, Sony, Olympus etc…. Provides soft, even, flash illumination. Light weight and easy to carry. Canon, Nikon, Sony, Olympus Etc…. Flash GN: 15. 5 48 PCS LED makes higher luminance and lower static power consumption. 3 High definition LCD display screen shows more vivid and clear objects. The diffuser is used to create exposures of even density over the entire surface of film. Use the diffuser by placing it flush against the front of the lens and exposing through it. The light that passes through the diffuser and on to the film will create an even density across the surface of the film. Advance features — Such as modeling flash,TTL flash are not included. - Reflection flash—Can reduce the shadow behind the body was taken to achieve more naturally photography effect. Flash diffuser x 1. 12 pieces Color Gel Filters for lighting effects and color correction. Cut to fit most Flash model. Applications are almost endless with these gel colors. Purple,Navy blue,Middle blue,Light blue,Dark green,Light green. Support Nikon flash gun which trigger on hot shoe,also support ITTL. TF-322 Optical Slave Trigger Hot Shoe Converter for Nikon. TF-322 Optical Slave Trigger Hot Shoe Converter for Nikon x1pcs. lens adapter. Perfect compatible for your Speedlite. For Nikon Speedlite SB-900/SB-910. This flash diffuser is an essential piece of kit that any level of the photographer should own. The diffuser box fits snugly on to the compatible flash unit without the use of fastenings and simply diffuses the light output of the flash, producing softer shadows. Shooters looking to mount the flash to a larger bracket or to a stand with an umbrella would probably need a longer version of this cable. The other side can be attached to any stand, tripod, or device with a standard 1/4"-20 threaded stud or flash shoe mount. For Nikon AF-S Nikkor 24-120mm f/4G ED VR Lens. 1x Flash Diffuser Softbox. Perfect compatible for your Speedlite. For Canon Speedlite 430EX/430EX II. This flash diffuser is an essential piece of kit that any level of the photographer should own. The diffuser box fits snugly on to the compatible flash unit without the use of fastenings and simply diffuses the light output of the flash, producing softer shadows. JJC Cold Shoe Flash Extension Bar CS30 300MM For Canon, Nikon, Sony. JJC Cold Shoe Flash Extension Bar CS25 250MM For Canon, Nikon, Sony. CS-30 Length 300mm. 4" shoe rail on top and Double locking nut allows bar to slide and rotate. With this Hot Shoe Extension, you can have more lights used with one cam, simply insert the item to the hot shoe position, and then put the LED lights in. Hot Shoe Extension Bar x 1. Length: 12cm. Color: Black. Canon 540EX, 550EX, 540, 550 EX, Flash Speedlight B7C6 B7C6. 1 x Bounce Flash Diffuser 540EX. To use the diffuser place it flush against the front of the Speedlites lens and flash through it, thus the light will pass through the diffuser creating an even density over the whole subject area. Perfect compatible for your Speedlite. For Canon Speedlite 580EX/580EX II. This flash diffuser is an essential piece of kit that any level of the photographer should own. The diffuser box fits snugly on to the compatible flash unit without the use of fastenings and simply diffuses the light output of the flash, producing softer shadows. Similar specification to the Nikon SC-28 cable at a fraction of the price. No complicated exposure calculations are necessary, just fit it and start shooting. Professional i-TTL Flashgun Cable for Nikon. For soft indirect flash light use the pure white size. For greater range and spectral highlights use the silver size. for Vivitar 2500, 273, 3500, 850AF. for Tumax 988. for Sunpak 2000DZ, 266D, MZ440AF. For most of speedlite. 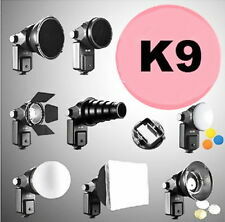 - Mainly used for mainstream large speedlites, provides eye light for portrait photography. Item Size: 44 44 18cm. Mount Type: Fastener Tape. Luminance Angle: 120°. Light Source: 96 LED beads. 1x 96 LED Video Light. Can also mount on lamp stand with 1/4" screw. Color Temperature: 3200K/5500K. 1x White filter. 1x Yellow filter. Note :The batteries are not included in the picture ！. Loosen the clamping screw shoe, slide flash into mount and tighten snugly. SHOOT BETTER PICTURES WITH MORE PROFESSIONAL RESULTS! BRACKET FEATURES. This cable has a 3' heavy-duty coiled cord and features a shoe mount on the bottom of the flash connection shoe, as well as a 1/4"-20 socket.